The new Panafax UF-5500 is more than just a high performance G3 fax machine, it's a reliable and efficient multifunction station designed to meet the needs of today's office enviroment. 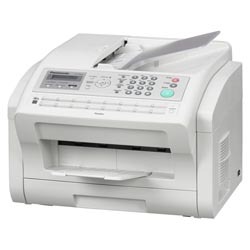 The UF-5500 Multifunction Fax machine is perfect for a single office user or a workgroup of users. With the standard 10/100 BaseTx Ethernet Port, the UF-5500 can easily be used as a network laser priner, network color scanner or a network PC fax. Whatever your needs are, the UF-5500 is the perfect solution for any size office.